Holiday home Sur les Douves for 10 people lies on 25 hectare estate in the vicinity of the charming Durbuy. 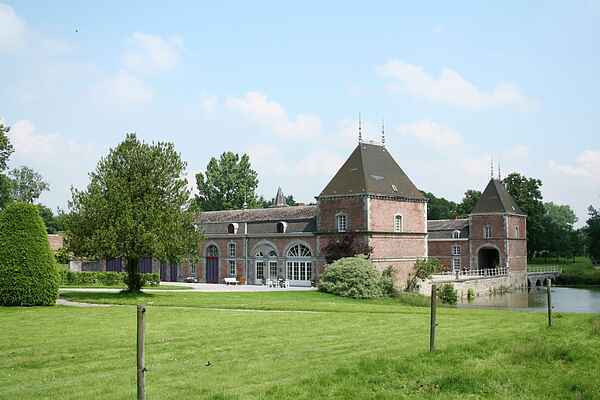 On the estate there's an 18th century castle with annexes, two lakes and a vast forest. Horses are grazing on the surrounding farmland. There is a large gravel terrace with views over the lakes. Because of the two lakes, we ask parents to mind their small children. This delightful holiday home is located in a completely restored part of the former stables and has all modern conveniences. Sitting on your terrace, you have a beautiful view and you imagine yourself as lord of the castle. You can use the owner's boat to sail on one of the lakes. Also ideal for children (they should be able to swim of course). On request you can also use the tennis court which is just 50 metres from the home. Activities in Dubuy include kayaking. Also worth visiting are the castle of Modave from the 13th century, the estate of Chevetogne and the caves of Han-sur-Lesse.